Ask fellow campers about "Berkshire Lake Campground" and nearby attractions. I am a part time full timer and spent three months at this park. The staff was very helpful anytime I asked questions. The park needs updating and they need to keep up on the mowing of the grass as it gets long frequently. They have a very large seasonal section and a much smaller non-seasonal section. It is convenient to Columbus and most sites are easy to get into (however they are not very wide at all, my slideout would overhang into the site next door). We camped at Berkshire Lake Campground in a Travel Trailer. Our family stays here monthly, we've been here for 3 months so far, and we love it! There are many activities to choose from all summer long, and during holidays. The pool is very large, and up to 10 feet deep. The lake is a nice place to take a walk around as well as to fish. And they also have miniature golf that's free on Fridays otherwise it's only a $1 per person. 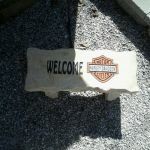 The staff here has always been very nice to us, and have helped us as best they could when we needed it. We are so happy to have found this place! We camped at Berkshire Lake Campground in a Travel Trailer. The staff is very knowledgeable in every aspect of camping. The employees in the camp store are incredibly nice, we bring our kids in here and they are always very sweet with them. They have a pool, restaurant with bar, as well as basketball hoop and mini golf and a fishable lake. All throughout the summer they have a lot of activities going on that are a lot of fun. They have on-site maintenance. We camped at Berkshire Lake Campground in a Travel Trailer. Good luck getting past the rude scheduler. I live locally and went to the park to check it out as I drive a large rig and pull a trailer, and I had read reviews about skinny roads and trouble parking. Their "big rig" area is a joke. Sites that were described as 100 ft in length are barely 60 feet and all are at a tight 90 degree angle with culverts and trees in the way. I was blown off while trying to ask questions. I have rarely had such completely unprofessional, rude treatment from anyone associated with a park, let alone a family run facility. Unbelievable they are in business! Run! We camped at Berkshire Lake Campground in a Motorhome. Park needs some updating. Did not use pool, or any other items. Our slide-out was into the area of the next site, and a fire pit was 3 feet from the slide-out. A holiday weekend, had gated entrance meet by friendly staff. I talked to the nearby guest he also said he would not return to the park (he comes to area often). Park is not too expensive, just needs some site updating, and the small sites should NOT allow fire pits (NOT enough room between sites). We camped at Berkshire Lake Campground in a Motorhome. Does offer camp store, pool, meeting area. I drove up with my dog Friday night to set up for the family arriving Saturday. When I checked in one of the staff members escorted me to the site and assisted with me backing in. The office staff was very friendly and helpful. The daily overnight sites are very close to all the amenities of the campground so some might find the "traffic" in that area a bother, but I liked the atmosphere. The showers are very nice and clean and private. The walking path around the pond is a must see. Very relaxing and there are no sites that sit right on the pond so everyone can enjoy its beauty. The upper camping area is for seasonal guests and is very well kept and has gravel roads for travel and great walking. Oh, did I mention we loved it so much we are returning next year for the season! A truly hidden gem in the area! We camped at Berkshire Lake Campground in a Motorhome. Make sure you take a walk to the pond and around the entire grounds. Also stop in the pub that is on the grounds for a good meal. This is a large RV park that appears to serve a number of seasonal campers. They have a schedule of activities for those staying more than one night. We had arrived after the office closed and they had left a packet taped to the front door with the usual info and a large map of the park with the route to the site clearly highlighted. The wifi worked at our site but like most it, it lost connection no and then. Local TV channels from Columbus were easy to get. While the site spacing was fairy close, most would have little trouble with slides. We camped at Berkshire Lake Campground in a Travel Trailer. I came here for a long term stay until I bought a house. I was charged $650/mo that was suppose to include basic hook up and WiFi. During the 3 weeks here I never got WiFi, went to office and they basically said "oh well" when asked to speak with the owner they said she was not in and she would not want to hear about this she had more important things to worry about instead if I could get WiFi. Campground is run down, extremely noisy with the golf carts running all over the place and the auto traffic. There is no control over the campers there as on weekends they are up all night making noise. You are parked on top of each other and you had better know how to drive to get into your site, they won't help you. Muddy sites, very little gravel and the road coming in is a wash board. I had to turn my tv up very loud to begin to hear it. I left this campground as soon as I found another one and very pleased with this one. Oh yea when I went back to speak with the owner I was told by an elderly lady that she would be in in the morning, I explained I would be at work, the lady stated, "if you want to see her you will come in when she is here, she will not come in to see you on your schedule". I have been a full-time camper for the last 4 years and this is the worst AND I mean WORST campground I have ever stayed. Save your money go somewhere else. I don't think this place would not survive if it were not for the trailer people that live full-time on the hill. Would not recommend going up there from what I heard about what goes on up there. 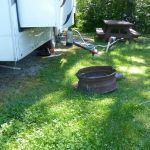 We camped at Berkshire Lake Campground in a Fifth Wheel. We have been coming to Berkshire for about 5 years now. We just travel to stay on weekends. The kids love it. There is so many things for families to do that its a packed weekend. My parents even come up from Pa to stay. Never complain. The staff in the office are just AWESOME every single time we have been there. Never had any issues with the sites or people at all. We camped at Berkshire Lake Campground in a Travel Trailer. Have to stop and visit the Party house. Has great food!! We planned to stay a few nights but left after one. Honestly, we would have left shortly after arrival but were too tired to look elsewhere. We were given a "pull through" site that was to accommodate our 40' coach and toad. It was 90 degrees off a narrow road and so we had to disconnect the toad in order to maneuver into it. Once there the leveling jacks punched through the thin layer of gravel and buried themselves into the soil. A small "swamp" lay across the site as well which looked to be the result of leaks in either the sewer or water system. As the site sloped too much we tried one across the road that was more level. No luck. There too the jacks went straight into the soil. Even after placing plywood under them. That folded up and went into the soil along with the jacks. Management finally brought us some 2x lumber and cement blocks which in combination solved the problem. Noise from barking dogs and speeding (yes speeding) cars and golf carts running past us until 11 pm dropped our evaluation of this place even further. At times the noise was so loud it drowned out the television (even with the windows all closed). We walked though nearly all of the park that evening and took in the sights. There were no other pedestrians. Everyone drove around on golf carts. None of the roadways are paved and the little remaining gravel is seriously pock-marked with deep pits and ruts. Made me wonder how folks would feel comfortable speeding on it but I could never answer that one. Bottom line is this park is well past its prime. Whoever owns it has got to be sucking the income and using it for other things. There is just too much "deferred maintenance" showing compared to the high number of guests (nearly all permanent homes) who must provide a positive cash flow. We will stay in a truck stop before we stay in this place again. We camped at Berkshire Lake Campground in a Motorhome. Nice setting with a beautiful lake and walking path, but it needs to be maintained better! The bathrooms, showers and laundry facilities are so-so: especially the laundry facilities. They were never clean during our 2 month stay and pretty gross to use. The campsites are never cleaned after campers depart. I even spent time picking up litter after a storm: just because I didn't want to look at the mess! There's a restaurant/sports bar on site, but it has a very limited menu. Gravel roads and lots are often muddy after rain. We had a terrible time getting level: more so than anywhere else in 9 years of camping. Staff is pretty much hands off and it's a family run business. The best part about this park if their annual Halloween Party and haunted hayride. Well done and lots of fun. Maybe it's better in the summer, but we needed a short term (2 month) place to stay near Columbus and this was the most convenient spot. We camped at Berkshire Lake Campground in a Motorhome. This campground was well maintained, with pre-Memorial Day work still under way. There was a fairly steady procession of golf carts and other maintenance machines on the roadways while we were there. But they were not objectionably noisy and stopped before dinner time. Otherwise, this was a very quiet location, with no highway, train, or other noises to interrupt our sleep. The Wi-Fi here was one of the fastest connections we have ever experienced on the road! Verizon voice and data signals were strong as well. We would return here for an even longer stay than an overnight. We camped at Berkshire Lake Campground in a Motorhome. We had a wonderful stay at this campground last summer and fall. We stayed for 4 months so the rate relects a summer monthly rate. Great Wi-Fi and free The best 25 cent wings I ever ate at the party house on Wednesdays and fun events for the whole family, especially the haunted forest at Halloween. The lots are nice,big and grassy with firepits and picnic tables. There are plenty of places to walk your dog. Everybody there is super nice too. I will be back this summer. 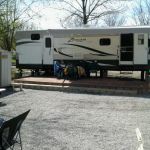 We camped at Berkshire Lake Campground in a Motorhome. Nothing fancy at all. Staff nice, site level in trees and near nice pool. It gets very crowded after lunch. Sites close together on gravel. Had rain so plenty of mud off gravel. Lots of kids. Only stayed here because of relatives near by. Close to Westerville and Polaris area. Campground itself needs a major upgrade to get a better rating. Restrooms were fairly clean but well used. This is not a vacation spot in my opinion. Stayed here a week. We camped at Berkshire Lake Campground in a Motorhome. 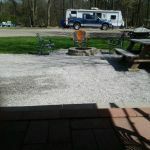 This campground is close to I-71 and US 36/37. Sites are moderately level. Pool is immaculate. Staff is friendly, restrooms could use some updating. Very nice 5 to 6 acre lake with plenty of fish! Would stay here again. We camped at Berkshire Lake Campground in a Travel Trailer. Are you affiliated with Berkshire Lake Campground ?